DC Deck Building Game: Crisis Expansion Pack 4 is an expansion for the DC Deck Building Game by Richard Brady and Matt Dunn, published by Cryptozoic Entertainment. It is for 1-5 players. This expansion adds 6 new hero cards and 8 new crisis hero cards, as well as 9 Impossible super villains and 4 crisis only super villains. It also adds 32 new cards for the main deck and 12 personal crisis cards. For more information on the many different DC Deck Building Game core sets that this product can be used with, please check out the link below. 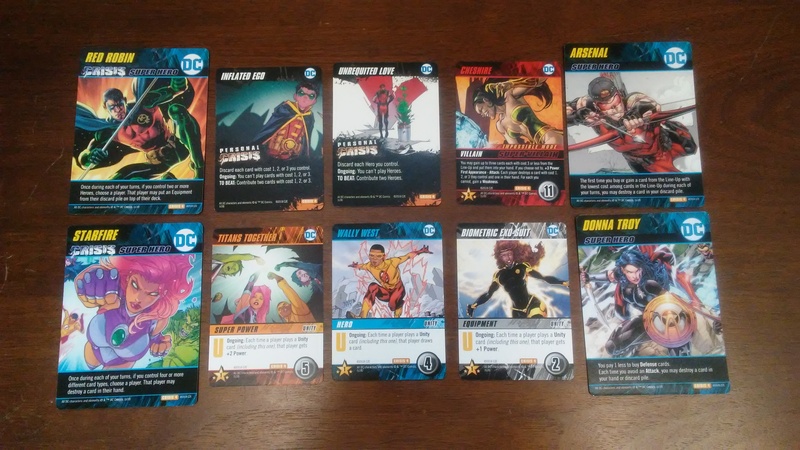 If you’ve never played the DC Deck Building game, let me take this opportunity to quickly explain the basics of how a core box set is played. Each player begins with 7 punch cards and 3 vulnerabilities to create their starting deck. They also begin the game with one of the many different variety of DC super heroes, or Villains if using the Forever Evil core set. The main deck of cards is shuffled together and the top 5 cards are flipped over and placed in a row known as the lineup. The Kick and Weakness cards are placed in separate stacks above the lineup along with a stack of Super Villain cards. The Super Villain cards are shuffled together and 7 cards are randomly placed face down with one specific card placed face up on top. The specific villain card is usually noted in the rulebook for that particular core set. Players shuffle their deck and draw 5 cards to begin the game. On a player’s turn, they will be playing cards from their hand to gain power which can be used to buy cards from the lineup, the kick pile or even defeat villains with. Some cards will also give special abilities which will further aid the players. Each time a card is purchased or defeated, it’s placed in the player’s discard pile and will create an even more power, helping the player to earn more points to be able to purchase more powerful cards with and defeat even stronger villains. Each player’s Super Hero will also provide them with special powers that can be used during their turn. Players continue adding cards to their decks and defeating villains until the final super villain is defeated. When that happens, players add up all their victory points from the cards in their decks to find their total. The player with the most points is the winner. With a basic knowledge of how the game works, it’s time to look at this expansion to see exactly what it adds to the game. For those players already familiar with any of the previous 3 Crisis expansions, much of this will be very familiar. With the Crisis expansions there are 2 different modes of play that may be utilized. There’s the Competitive mode and the Crisis mode. Competitive mode is played pretty much the same way as the basic game, just with new main deck cards sprinkled in to the top half of the deck. Any of the new oversized Super Hero cards can be used by players, however it’s recommended to leave out the Crisis Super Heroes. The new Impossible super villains cards may also be used, however the Crisis super villains should also be left out of the competitive game. In Crisis mode players will be working together while dealing with Personal Crises. This mode of play is a little bit different and takes a bit more explanation. Crisis Mode is set up much the same way as the basic game, with a few exceptions. Instead of 8 Super Villains, the number of Super Villain cards that are used are determined by the number of players. The fewer the players, the more villains to contend with. Instead of the basic Super Villain cards, Crisis mode utilizes the Impossible Super Villain cards. To set up the stack, the Trigon card is placed face down. The Slade Wilson card is set aside and all the remaining Impossible Super Villain cards are shuffled together. A certain number are then placed face down on top of the Trigon card, as noted in the rulebook and based on the number of players. Slade Wilson is then placed face up on top of the stack, which is then placed beside the stack of Kick cards above the lineup. Any remaining Super Villain cards are returned to the box. The Personal Crisis cards are shuffled together and placed face down beside the Super Villain stack. Each player is dealt 1 Personal Crisis card which is placed face up in front of them. Once these additional steps to the normal setup have been completed, play now begins. Much of the gameplay for Crisis Mode is exactly the same as in Competitive mode, or the basic mode of play for any of the core sets. There are however a few differences. For instance, when you buy or gain a villain card from the line up, normally you would put these into your discard pile. In this mode, you simply destroy it. Destroyed cards are not the same as cards that are removed from the game. Destroyed cards are still a part of the game and may be interacted with. Removed from the game cards are returned to the box and can not be interacted with any more. If you defeat a super villain, you will do the same thing as buying or gaining a regular villain except that you will also gain a Personal Crisis, more on these in a moment. Another note on super villains is that you can’t defeat a super villain until there are no more villains face up in the line up. Another change in this mode is refilling the line up. Instead of filling each empty slot during the end of a player’s turn, only the top card from the main deck is added to the line up at this time. This means that the line up will fluctuate as the game goes on. The last change is with Impossible Super Villains. These are much stronger and harder to defeat villains. When playing with these, if a Weakness is destroyed, it is returned to the stack of Weakness cards. Also if a card needs to be added to the line up from the main deck and there aren’t any to add, the game is over and the players lose. Earlier I mentioned Personal Crisis cards, these cause negative effects and many times hinder the player in lots of different ways. First, at the beginning of a player’s turn, the top card of the main deck is destroyed for each Personal Crisis card that the player has. This depletes the deck faster causing the players to lose quicker. To remove these from play, they must be beaten. These cards are beaten by following the directions at the bottom of the card that say, “To Beat”. This involves placing cards from your hand next to or under the Personal Crisis card that meet the requirements. It should be noted that other players may contribute to their team mate’s Personal Crisis cards as well. Once the requirements to beat the card have been met, all the cards contributed to it are removed from the game and the Personal Crisis card is placed in the Crisis discard pile beside the Personal Crisis stack. In this game, a new Keyword is introduced; Unity. These cards are easily identified by the large U in the text of the card. These cards will usually provide a benefit to the players when the card is played. The more Unity cards that are in play, the more powerful they become. For instance, the Super Power, “Titans Together” allows the player to gain +2 power for each Unity card that they play, including the “Titans Together” card. With Crisis mode, the game continues with players taking turns defeating villains and purchasing cards until one of two things happens. If all the Super Villains in the stack have been beaten before the main deck runs out, the players win. If a card from the main deck needs to be added to the line up and there are no more cards to draw from, the players lose. This expansion comes with lots of new cards that can be added to any of the DC Deck Building Game core sets. There are 14 oversized character cards; 8 Crisis heroes and 6 regular heroes. The Crisis heroes are new versions of the characters in the Teen Titans core set which have new powers. 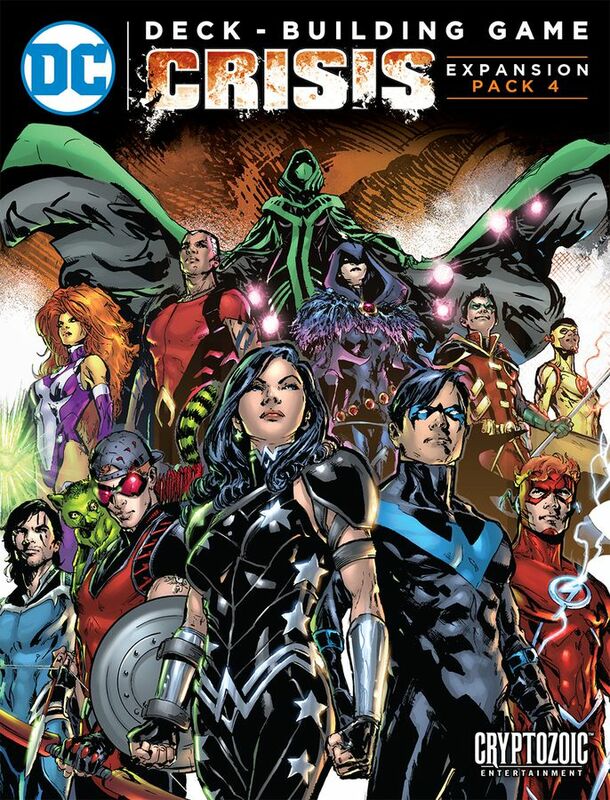 The new heroes are Arsenal, Donna Troy, Nightwing, Omen, Tempest and the Flash. There are 9 new Super Villain cards that may be fought against, as well as 4 Crisis Super Villains which are only used when playing Crisis mode. There are also 32 new main deck cards that can be added to the game for either Crisis or Competitive mode. Finally there are 12 Personal Crisis cards. Each card in this expansion is based on characters from the Teen Titans comics from the DC comics universe. The Personal Crisis cards focus on specific storylines from those comics. The look and feel of each card is really amazing looking. The artwork looks like it was ripped straight from the pages of the comics. The designs are exactly like those in previous sets and expansions so that these are easily added to any set. One more thing of note is that the expansion also comes with a randomizer card that can be used with the Multiverse set, as well as a plastic divider with the same image as the one that’s on the box. This divider is great for keeping the expansion separated from the rest of your expansions and sets in the Multiverse box. Honestly, I’ve always liked the characters from the Teen Titans comics so to expand on the characters in the Teen Titans core set is a major plus in my book. I especially like the addition of Arsenal, which means I can use Green Arrow and Arsenal together in the game. If it’s not been completely obvious by this point, let me state that this expansion works best with the Teen Titans core set but can be used with any set. Overall the cards work together really well and look amazing. I am very pleased with the look and feel of everything that comes with this expansion. The rulebook for this expansion isn’t all that big. Those players familiar with any of the previous Crisis expansions will find the size of those rulebooks similar to this one. The book goes over both the Crisis mode and the Competitive mode. For Competitive mode, there’s only a small paragraph explaining it, while Crisis mode covers a couple of pages. Instructions for using Personal Crisis cards, Impossible Super Villains are also covered in great detail, as is the new keyword Unity. There are a couple of pages that are devoted to clarifying how certain cards work from the oversized Super Hero cards to the Impossible Super Villains, new main deck cards and Personal Crisis cards. The book also includes a few frequently asked questions that go a little more in detail on certain subjects that may come up while playing. The back cover of the book features a handy reference for playing Crisis Mode, as well as for using Impossible Super Villains. As for the rules, I feel like everything is explained rather well. There should be anything difficult to understand about using this expansion. There aren’t a whole lot of pictures in the book. What’s here is just a few pictures of some of the cards. There’s only one or two examples of gameplay in the book, which is fine as there’s not much that should need additional explaining. Overall I feel like the rulebook gets the job done in a small and compact way without a whole lot of reading required. I’m fairly pleased with the results. As most of you know by now, I’m a huge fan of the DC Deck Building Game. I’ve played pretty much everything that has been out for the game since it first came out. Mostly this is due to my love for the DC comics universe. While I enjoy all the various costumed heroes and villains, I have to say that the Teen Titans have always been some of my favorite characters. I always liked Robin/Nightwing, Starfire, Raven and Donna Troy. Over the years the characters have grown and changed. I still like the Titans though, so for me this expansion paired with the Teen Titans core set is absolutely gold. I like that this has two different ways to play with the Crisis mode and Competitive. Of course the competitive mode is great for playing with friends that simply want a quick and simple game to play with the DC characters. This expansion allows you to add a stack of new cards to the main deck and change up the game a bit without going to overboard. The Crisis mode allows you to really get into the game. I wouldn’t recommend playing this way with your casual players. It can be rather tough, especially with those Impossible Super Villains. They are called Impossible after all. Those Personal Crisis cards really throw a monkey wrench into what you’re doing too. Needless to say, you can find yourself losing several times without blinking. However I really enjoy the challenge. With the Crisis mode, you can also play the game solo which is awesome. Speaking of solo, yes the solo mode is a lot of fun. It’s a bit of a challenge but I love a good challenge. I can’t forget to mention the new Unity keyword either. I like how that the more of these cards that you play the more power and abilities you’re able to generate. Once you get a stack of these rolling, it makes those super villains a bit easier to beat. Needless to say, I’m sure you’ve figured out by now that I really enjoy this expansion. I’m pretty sure that fans of the DC Deck Building Game, especially the Teen Titans set, will love what this brings to the table. This is an expansion that I would highly recommend. For me, it’s a most definite must have. DC Deck Building Game: Crisis Expansion Pack 4 is an expansion for the DC Deck Building Game. It’s compatible with any of the core sets but has a special connection with the Teen Titans set. It adds adds 6 new hero cards and 8 new crisis hero cards, as well as 9 Impossible super villains and 4 crisis only super villains. It also adds 32 new cards for the main deck and 12 personal crisis cards that are all centered around the Teen Titans. The game length varies depending on the mode of play chosen and the number of players. Most game sessions last between an hour and two hours. The cards that come with this expansion are absolutely gorgeous. I especially like the addition of new characters like Arsenal and Donna Troy. The images on each card look like something ripped from the pages of a DC comic. The new mechanics of the Personal Crisis cards and the new Unity keyword create new challenges and new ways to play an already great game. Thematically I think that the expansion capitalizes on the themes and feelings of the Teen Titans comics quite well. Needless to say, I absolutely love this expansion. Fans of the DC Deck Building Game, especially the Teen Titans core set, should really enjoy this expansion. I highly recommend this one. It’s a must have. Now back to more teenage angsty drama. This entry was posted in Reviews and tagged 4, board, board games, brady, building, card, card games, crisis, crisis expansion pack 4, cryptozoic, cryptozoic entertainment, dc, dc deck building game, deck, dunn, entertainment, expansion, games, matt, matt dunn, richard, richard brady, richard garfield. Bookmark the permalink.